Since the fall of the Iron Curtain, migration has become a major cause for concern in many European countries, but migrations to, from and within Europe are nothing new, as Klaus Bade reminds us in this timely history. A history of migration to, from and within Europe over a range of eras, countries and migration types. Examines the driving forces and currents of migration, their effects on the cultures of both migrants and host populations, including migration policies. Focuses on the nineteenth and twentieth centuries, particularly the period from the Second World War to the present. Illuminates concerns about migration in Europe today. Acts as a corrective to the alarmist reactions of host populations in twenty-first century Europe. Klaus J. Bade was born in 1944 in Sierentz, Alsace-Lorraine. He is chair of modern history and director of the Institute for Migration Research and Intercultural Studies (IMIS) at Osnabrück University. He has held visiting professorships at Harvard and Oxford and fellowships at the Netherlands Institute for Advanced Study and Wissenschaftskolleg zu Berlin. He won the Philip Morris Research Award in 2001 and is a member of numerous scientific organizations, commissions and advisory boards as well as head of German and international research projects. He is co-editor of several book series and journals and author and editor of more than 30 books on German and European history, including colonial history and population and migration past and present. Allison Brown has been a freelance translator of scholarly books and essays, largely in the fields of history and the social and political sciences, especially cultural studies, since 1988. She has studied linguistics and German studies, and has an MA in translation science. She lives in Berlin. 1. Migration during the Shift from Agrarian to Industrial Societies. 2. 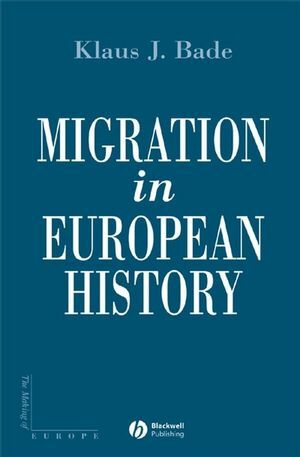 Migration in Nineteenth- and Early Twentieth-Century Europe. 3. The Period of the World Wars: Escape, Expulsion, Forced Labour. 4. Migration and Migratory Policies in the Cold War. 5. Europe: A Continent of Immigration at the End of the Twentieth Century.